The Forge, McMaster’s startup incubator, holds its annual Student Startup Competition this week. Twelve student teams will pitch their startups for the chance to win up to $100,000 in cash prizes and entry into The Forge Summer Startup Academy. 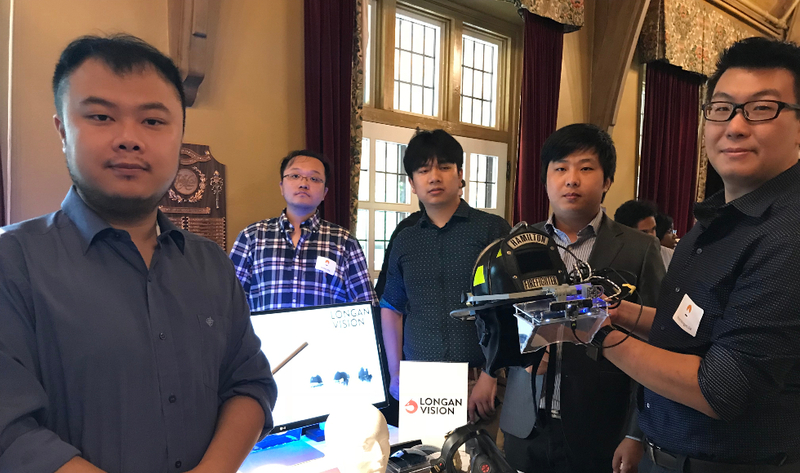 Last year, engineering graduate student Enzo Jia and his team of fellow Mac students won the Forge’s Engineering Summer Tech Entrepreneurship Fellowship for their company, Longan Vision, which had developed an augmented-reality visor for firefighters. Since participating in the Forge’s summer accelerator program, Longan Vision has demonstrated their technology to fire departments across southern Ontario. Here, Jia reflects on Longan Vision’s path to success. Longan Vision is focusing on developing an AR visor glass-Fusion Vision System for firefighters to locate victims in harsh environments. We’ve added several features to our FVS including edge detection, fire sources detection, a real-time communication system and indoor localization. Those features help firefighters to search for vistims, escape from dangerous situations and share images and data with their command centre. Tell us about the people in your company — are they all McMaster students? All my co-founders and myself are from McMaster. I just graduated from the Master’s of Applied Science with a major in mechanical engineering last year. One of my co-founders is a PhD student, and the other three are all undergraduates. Our company started from scratch! Our initial idea was to develop an AR glass for industries. However, after several months of investigation and market searching, we decided to change our research direction. Firefighters risk their lives to save people from buildings — and their heroism inspired me. I believed our product could help them prevent casualties and boost efficiency. What was participating in the Forge’s pitch competition like? It was a unique experience — our team had prepared three weeks before the competition. The Forge gave us lots of training on how to pitch in front of a large number of people, and how to deliver a message to the audience. How did the Forge help you get Longan Vision off the ground? The Forge not only provides space for startup companies, but they also gave us training that helped us understand how to develop a company and help it survive. The Forge taught us many valuable lessons, like how to search and apply for funding, how to do research and development, and how to limit our budget. What are some challenges with being a startup? What successes have you had? The most significant problems for a startup are having a low budget and finding the right market. Lack of funding can limit company development and can affect motivation. We contacted a variety of investors and shared our ideas with them, and also attended a variety of pitch competitions to get extra funding and exposure. Our co-founders also put money into the company in order to sustain our development. The second challenge is finding the right market. We’ve seen lots of startups that have great ideas, but find that customers are not willing to accept their ideas when they start to promote their company. Clearly, market research is vital for startups before they begin to develop products. For us, before we built our solution, we did lots of interviews with our target customers — the firefighters who would make sure our solution could solve their problem. Working together with firefighters was very important. Everyone is quite busy right now as we work to meet the demands of our future customers. We have developed solid relationships with a variety of fire departments who will be our first round of customers. What’s your advice for the students competing in the pitch competition? Be brave — share your idea and never give up on developing it! The Forge, McMaster's startup incubator, <a href="https://www.eventbrite.ca/e/the-forge-student-startup-competition-2019-tickets-55925687236">holds its annual Student Startup Competition this week</a>. Twelve student teams will pitch their startups for the chance to win up to $100,000 in cash prizes and entry into The Forge Summer Startup Academy. Last year, engineering graduate student Enzo Jia and his team of fellow Mac students won the Forge's Engineering Summer Tech Entrepreneurship Fellowship for their company, <a href="https://www.longanvision.com/">Longan Vision</a>, which had developed an augmented-reality visor for firefighters. Since participating in the Forge's summer accelerator program, Longan Vision has demonstrated their technology to fire departments across southern Ontario. Here, Jia reflects on Longan Vision's path to success. <strong>What does your company do?</strong> Longan Vision is focusing on developing an AR visor glass-Fusion Vision System for firefighters to locate victims in harsh environments. We've added several features to our FVS including edge detection, fire sources detection, a real-time communication system and indoor localization. Those features help firefighters to search for vistims, escape from dangerous situations and share images and data with their command centre. <strong>Tell us about the people in your company -- are they all McMaster students?</strong> All my co-founders and myself are from McMaster. I just graduated from the Master's of Applied Science with a major in mechanical engineering last year. One of my co-founders is a PhD student, and the other three are all undergraduates. <strong>How did your company get started?</strong> Our company started from scratch! Our initial idea was to develop an AR glass for industries. However, after several months of investigation and market searching, we decided to change our research direction. Firefighters risk their lives to save people from buildings -- and their heroism inspired me. I believed our product could help them prevent casualties and boost efficiency. <strong>What was participating in the Forge's pitch competition like?</strong> It was a unique experience -- our team had prepared three weeks before the competition. The Forge gave us lots of training on how to pitch in front of a large number of people, and how to deliver a message to the audience. <strong>How did the Forge help you get Longan Vision off the ground?</strong> The Forge not only provides space for startup companies, but they also gave us training that helped us understand how to develop a company and help it survive. The Forge taught us many valuable lessons, like how to search and apply for funding, how to do research and development, and how to limit our budget. <strong>What are some challenges with being a startup? What successes have you had?</strong> The most significant problems for a startup are having a low budget and finding the right market. Lack of funding can limit company development and can affect motivation. We contacted a variety of investors and shared our ideas with them, and also attended a variety of pitch competitions to get extra funding and exposure. Our co-founders also put money into the company in order to sustain our development. The second challenge is finding the right market. We've seen lots of startups that have great ideas, but find that customers are not willing to accept their ideas when they start to promote their company. Clearly, market research is vital for startups before they begin to develop products. For us, before we built our solution, we did lots of interviews with our target customers -- the firefighters who would make sure our solution could solve their problem. Working together with firefighters was very important. Everyone is quite busy right now as we work to meet the demands of our future customers. We have developed solid relationships with a variety of fire departments who will be our first round of customers. <strong>What's your advice for the students competing in the pitch competition?</strong> Be brave -- share your idea and never give up on developing it!